It has been ages since I posted on my own blog, and even longer since I posted here on the Hobby Art blog. Life just seems to have got in the way recently lol. Anyway, a couple of weeks ago a fabulous new stamp set dropped onto my mat from Jenny, the October Stamp of the Month Poppy Heads. 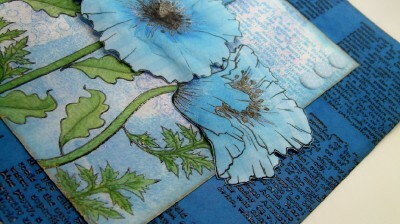 I love poppies and this is no exception. As luck would have it I had some pieces of Gelli Plate background on my desk and so I decided that I would use one of them as the base for my card. As it was blue I thought it would get away from the usual red poppies for a change. 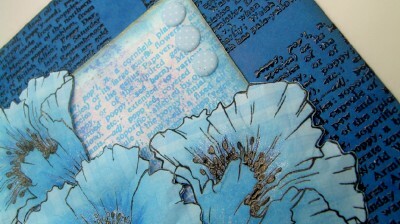 This fabulous set comes with a text background stamp which I used randomly on my piece of handmade background paper. and then coloured them in using Spectrum Noir Alcohol pens. 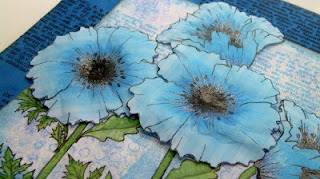 I didn’t want to have to do any masking so I stamped and embossed the poppy flowers onto some gingham background paper from my stash and then fussy cut them out. I added some extra colour with Distress Ink and Black Wink of Stella and attached them using silicon to add a little depth. The background to the card has been created by stamping and embossing the text randomly onto a piece of matching blue cardstock from my stash. This entry was posted in Monthly Specials and tagged gelli plate, poppies, wink of stella on 15/10/2015 by Kim Reygate. Introducing the new Monthly Special. This is the Stunning new Poppy Sketch set designed by Sharon Bennett for Hobby Art. Foam Mounted Grey Rubber Stamp backed onto EZ Mount so will adhere to any Acrylic Block. The Monthly Special includes a free A4 Project sheet with step by step instructions on how to make a card by a member of the design team. RRP £11.99 (after June) or £6.25 individually. These are available individually too, but obviously is better value when brought together in the Monthly Special. 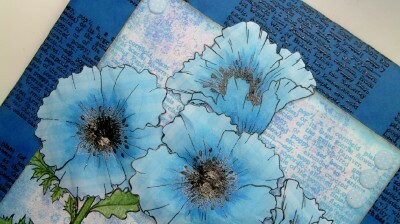 This is the gorgeous new Foam Mounted “Poppy Bloom” Designed by Sharon Bennett. Measuring 80mm x 85mm approx. This is the gorgeous new Foam Mounted “Poppy Field” Designed by Sharon Bennett. Measuring 120mm x 85mm approx. You can purchase the Monthly Specials individually each month. 3 month Subscription so you never have to miss one. With the subscriptions they will be automatically dispatched on the payment date each month. This entry was posted in Monthly Specials, News on 27/05/2015 by Becki. The Monthly Special includes a free A4 Project sheet with step by step instructions on how to make a card by Jenny Mayes. RRP £11.99 (after May) or £6.25 individually. This is the gorgeous new Foam Mounted “Harbour Scene” by Sharon Bennett measuring 130mm x 75mm. This is the gorgeous new Foam Mounted “Seagull Harbour” measuring 112mm x 85mm. So I’ve realised recently speaking to a few of you, we haven’t explained the Monthly Specials very well. 1. 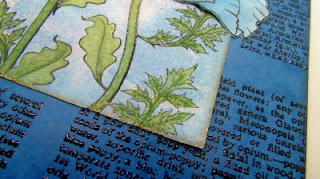 Every Month a new stamp set or in this case 2 Foam Mounted Stamps is launched on the 1st of the Month. 2. The Monthly Specials are offered at a discounted rate £8.99 for that month only. They will then revert to the RRP after that date. 3. The Monthly Specials are P&P Free so even though they don’t reach our minimum spend £9.99 this is a special offer and we have made an exception. 4. 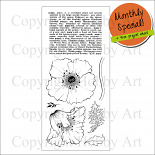 The Monthly Specials include a Free Project Sheet for the launch month as part of the package. 5. If you have missed one they are still available but at the RRP. I hope that has helped answer a few questions… if you have any more just drop me a message below. PPS. We have been exceptionally busy for this set. So turnaround is a little slower than usual. 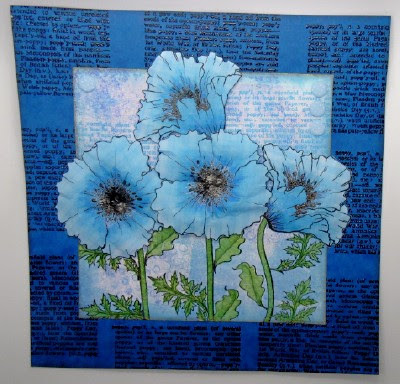 This entry was posted in Monthly Specials, News on 06/05/2015 by Becki.